So as you can see this is an outfit post with a bit of a twist- the twist being my body is missing. After last weeks FABB Event in Leeds I'd arranged to meet Holly in town for a quick drink and as time wasn't on my side I'd forgotten to take photos of myself in the outfit. As we we're trying to have a "adult" night out I decided this would be the perfect opportunity to wear my new Rare dress. I think I'm starting to go through a right cobalt/electric blue phase at the moment and I just love the contrast with the white blazer (the dress looks equally as good toughened up with a leather jacket). Rare is a brand which I have always been aware of (its one of the concessions in Topshop) and I'll be honest I normally would have avoided - purely as the sizing is on the small/short size - ie Judith had to pull the dress over my chest and it literally skimmed my bum. However recently Rare has had a revamp as this dress is short but not too short for all of my 5'10". Also the sizing seems to be more true to size as I ordered this in my normal size and its slightly big on me (however this may be due to the 10lb I've lost since having my tonsils out). Want to know the best thing about this dress - its currently reduced to £10 in the sale... oh yeah. And as standard it didn't end up being an "adult" night out - we ended up rolling in at 4.30am as you do. Cute dress! 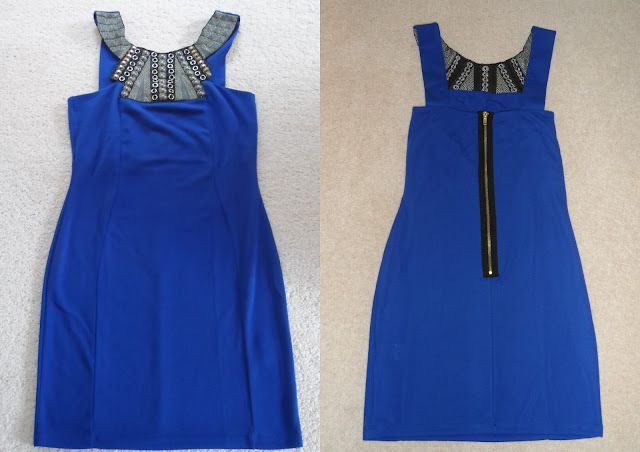 I love the blue colour and the detailing at the neckline. What a bargain for only 10 quid! The neck of this dress is amazing! I love electric blue too, such an underrated colour especially for nights out.. And well done on your 4:30 roll in, I bet it was a damn good night!